Flashy young stars and a return to the post-season have created high hopes in Toronto. Now it's up to the Maple Leafs to live up to their promise. The Hockey News is rolling out its 2017-18 Team Previews daily, in reverse order of Stanley Cup odds, until the start of the season. Today, the Toronto Maple Leafs. Do the Leafs need to seek outside help on defense? The Maple Leafs were defensively deficient last season. They were as exciting as any team in hockey but, for all the scoring chances they generated, they allowed a ton as well, resulting in a lot of “high-event” games at either end of the ice. 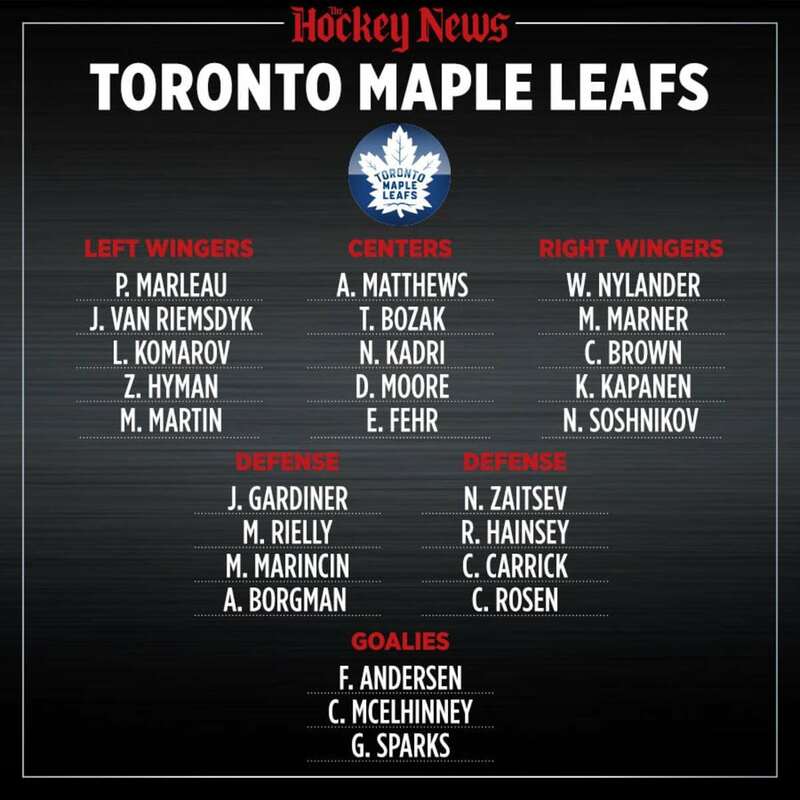 Toronto’s top-six defense corps projects to boast two newcomers at the moment, with Ron Hainsey joining Morgan Rielly on the second pairing and Calle Rosen possibly supplanting Martin Marincin on the third pair. But does either player upgrade this group enough? Hainsey is 36 and Rosen is unproven. The Leafs need a legitimate, in-his-prime shutdown blueliner, which is why they pursued a Travis Hamonic trade (unsuccessfully) this off-season. That means GM Lou Lamoriello might have to look outside the organization for help should the Leafs find themselves in contention for the Atlantic Division crown by the trade deadline. Toronto has a major area of surplus from which to deal, as its roster overflows with so many skilled forwards that an NHL-ready guy like Kasperi Kapanen has trouble even cracking the fourth line. The Leafs should be linked all year to high-profile, potentially available D-men. But don’t dream too much about Drew Doughty. Not happening. The Calder Trophy, a 40-goal season and a role as the Maple Leafs’ No. 1 center. That was Auston Matthews’ rookie year in a nutshell. So, what does he do for an encore? Toronto has an idea of what it would like to see, and it need only look to Western Canada. In his sophomore campaign, the Oilers’ Connor McDavid led the NHL in points and took his game to another level. Matthews may not be able to mimic the increasingly rare 100-point feat, but hitting the 80-point plateau is within reach. Any improvement from Matthews’ would boost an already impressive attack. And while Toronto would love that, no doubt, what would turn the tide is tougher defense. Despite having the NHL’s fifth-highest goal total last season, the Leafs’ goal differential was only plus-16 due to the ninth-most goals against. Signing Ron Hainsey gives the blueline a veteran leader, but Morgan Rielly, Nikita Zaitsev and Jake Gardiner are the true foundation of the defense. If all three can demonstrate a capacity to hang with the East’s top talents, the Leafs will challenge for their first division crown in 18 years. No team will worry about sophomore slumps as much as the Leafs. Freshmen Matthews, William Nylander and Mitch Marner accounted for 81 goals, nearly one-third of Toronto’s total of 251, and finished first and tied for fourth in team scoring, respectively. One of the three hitting a drought wouldn’t be disastrous, but the potential for all three to regress in terms of production, performance or both is very real and very frightening. There are other sources of offense, of course. Patrick Marleau, signed in free agency, provides a safety net with his consistency, but it would be difficult for the rest of the forward group to make up for any dip in production should the second-year jitters come in triplicate. Frederik Andersen proved he can backstop the team to the playoffs, but he needs to provide stability on a game-to-game basis. He had 11 starts last season in which he sported a sub-.850 save percentage. Only Kari Lehtonen and Tuukka Rask had more. The offense taking a dive is one thing, but if the goaltending follows suit, the Leafs could end up outside the playoff picture. THN’s PREDICTION: 2nd in the Atlantic. Toronto has the speed and firepower to outscore virtually any team in the East – plus above-average goaltending. Those qualities alone make this team playoff worthy again. Traversing the gap from playoff team to Cup contender depends on how much or how little the Leafs improve defensively.